Solidarity or Solo is a research and design project executed by third-year Graphic Design students at the Royal Academy of Art (KABK) in The Hague, initiated by the tutors Niels Schrader (Graphic Design), Lauren Alexander (Interactive Media) and Maarten Cornel (Philosophy). The project encouraged students to investigate their own relation to, and opinions about, the European Union by using mapping, archiving and referencing methods to formulate a refreshing and articulated view of what the EU means to a younger generation. 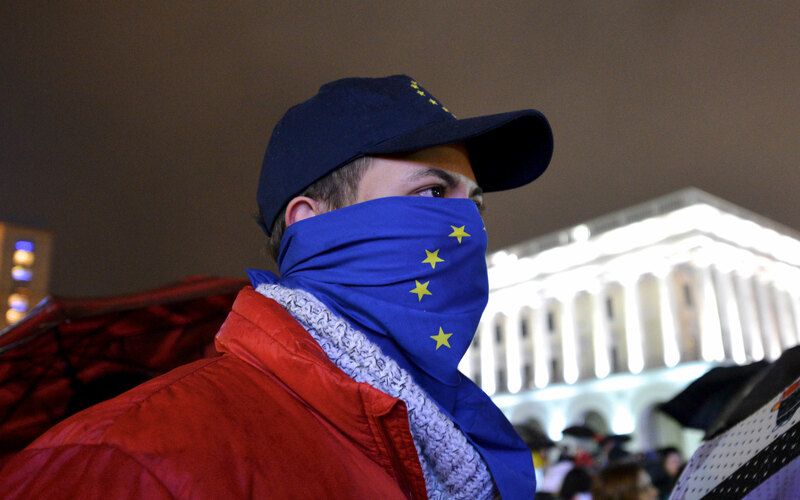 “Аn EU flag face mask” by Ivan Bandura. Only a disappointing 43% of Europeans voted during the May EU 2014 elections, which highlights the problematic disengagement between the European Union and its citizens. From the results of the elections, we also witness an increasing popularity of right-wing parties in France, Greece, Finland, Denmark, the United Kingdom, among others, as politicians tend to capitalise on Eurosceptic and xenophobic sentiments. Almost 60 years after the founding of the European Economic Community and 22 years after the Maastricht Treaty, the European Union faces severe challenges, as it emerges from the global financial crisis and has to combat a loss of confidence in the solidarity of the EU’s financial and political systems. One of the main goals in the creation of a united Europe, was to promote solidarity and prevent European conflicts as was seen in World War II (for which it was ultimately granted the Nobel Peace Prize in 2012). It is therefore both surprising and saddening to see so many Europeans being misled into thinking that “going solo” and opting out of the EU will somehow resolve their domestic economic problems. The EU as a concept seems to function as a scapegoat for economic frustrations as defined by right-wing forces. Against this background, it is not surprising to see how the EU’s visual vocabulary is made fun of and utilised by leaders and citizens in a variety of political contexts around Europe. The binary aspect of the title Solidarity or Solo illustrates this very fact. For example, during the May 2014 elections, Dutch right-wing politician Geert Wilders made a feeble attempt of justifying his proposal of the Netherlands abandoning the EU by symbolically cutting the “Dutch star” (as he referred to it) out of the iconic EU flag, declaring: “I am going to take this star back to the Netherlands and return it to the Dutch people in order to show that we don’t need this European flag and that we are proud of our own Dutch flag”. Meanwhile, in Ukraine, thousands of protesters wrapped themselves in the EU flag to not only symbolically replace their own Ukrainian flag with the EU flag as a powerful gesture of solidarity with the EU but also as a symbolic protest against the threat of Russian aggression. Wilders’ symbolic act was in strong contrast to those actions witnessed in Ukraine and was reminiscent of fascist acts from a bygone era. It is no coincidence that Wilders’ Party for Freedom (PVV) and the early Dutch Nazi party (NSB) share the same iconography in their party logos. We are proud to present this rich collection of alternative EU atlases in collaboration with Open!. They were designed by Graphic Design students under the supervision of Niels Schrader, Lauren Alexander, Maarten Cornel and special guest tutors Sjoerd van Oevelen and Elodie Hiryczuk. An atlas is usually seen as a collection of maps that define geographical dimensions, political borders and present natural features, illustrations, informative tables, charts and texts. However, for this course the atlas served also as a framework for research that stimulated reflection on the EU and beyond. It raised the question if – in times of global markets, intercontinental transportation and world-wide internet – the concept of national borders is completely overrated and became entirely redundant. European and non-European students alike were invited to rethink their perception of the EU and formulate an opinion on its current state. The resulting investigations reveal a broad range of approaches including critical analyses of consumer culture in the European Union especially in the tobacco, sugar and football industries. Student projects reveal intricate corporate, political and social interplay. Some of the atlases focus on the connections – and disconnections – between national identity and regional identities fostered by the Internet while others investigated the utopian notion of a sovereign national identity. Some of the atlas projects address the perceptions and personal stories that citizens have about the EU, with students employing intimate interview and data collection techniques. For example, the Crisis Situations and Unrest in Europe atlas creates an archive of conflicts that have occurred over the past decade, including the current crisis in Ukraine. The atlases touch on a variety of politically relevant and otherwise unexplored topics and as a collection provide insightful new interpretations of the delicate and complex web known as the EU. Students selected for the online exhibition: Alyar Aynetchi, Menno de Bruijn, Ines da Costa, Nina Couvert, Sanne Groenendaal, Mike Kokken, Max Lennarts, Ilse Modder, Wilco Monen, Sepus Noordmans, Eline van der Ploeg, Kasper Pyndt, Sara Risvaag, Tereza Rullerova, Marcel Schepen, Janine Terlouw, Ieva Valule, Fedor Velyaminov and Martyna Wyrzykowska. Nina Couvert, What if Ukraine Would Join the EU? Menno de Bruijn & Kasper Pyndt, Europe Utd.